The first few moments of the reception at Daystar Gallery. The last exhibition at the Wonder Graphics Tenley Gallery, showcased prints and art with unambiguous meaning. A man sitting in an alley just beyond the sunlit area with his head down on his arms in Norman Strike’s linocut is Down on his luck. 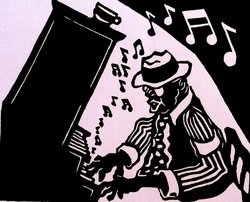 Deborah Gay’s linocuts strike a balance of black and white with fine lines. A micro or macro view is chosen by the viewer in a print of a paper airplane that either rests on doodles on a desktop or hovers over petroglyphed rooftops. Migration across a constellated sky is one underlying theme in Flying By, a monotype by CC Vess; free flight is another. 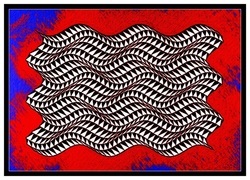 Woodcuts and etchings by Ann Zahn and a new series of archival digital prints by Lucy Blankstein. Top Drawer: STARS, STRIPES and RAINBOWS: Color coalesces into any or all of these emblematic symbols either within a representational composition or standing on their own including designer flags for ships, shops or imperatives. Second Drawer: DECLARATIONS: A celebration of freedom including prints and watercolors of the capital, the national mall and monuments, presidential sketches, and subject matter highlighting Washington, DC. acrylic/ Arches WC paper, 12x 16"
Whether from gestural beginnings ​or visual references, each painting resolves with its own logic into something that holds up its end of the conversation. A celebration of freedom including prints and watercolors of the capital, the national mall and monuments, presidential sketches, and subject matter highlighting Washington, DC. Cabinet ARTIST Portfolios: Blankstein, Cusick, Huff, Mark, Penay, P Segnan, R Segnan, Stout, Strike, Unger, Vess, Zahn. LINOCUTS BY NORMAN STRIKE: 1975- 2016. A retrospective of bold prints covering all aspects of urban life from ducks floating in a stream, to riding the bus, DC Chinatown, social issues including homelessness and of course, politics e.g. Lonesome George (W. Bush) and He just wanted to turn back the hands of time on Helms’ attack on the NEA. Strike says, “The real challenge is making something artistic while having a message.” He chose printmaking because it continues to be “a means to create imagery that's affordable.” Strike worked at Ann Zahn’s Printmakers’ Workshop in Bethesda and was part of the Washington Print Calendar for over 20 years. He recently participated in the international artists’ book, Metropolis. August- Sept. 20 2016: Color and Cars: the sensuousness of heat, grit, and summer breezes. Ann Zahn beach scenes, Norman Strike baseball and social commentary linocut, Claudia Vess painting and encaustic landscapes, invited artist Tom Kenyon’s racing car linocuts from his part real and part imaginary Kenyon Motors series. 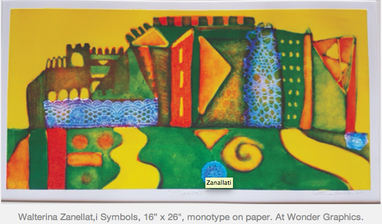 Sept 21- Oct 21 2016 Walterina Zanellati: Cities and Cats Living 44 miles south of Venice in Porto Tolle on the Po Delta, Zanellati imagines fairytale cityscapes with castles, arcades, towers, fields and moats in brightly colored monotypes. Cats are among her favored subjects. In these new prints, the artist, who is experienced in traditional methods, experiments with soy-based ink three-color printing whose transparent overlays heighten the imaginary atmosphere. Zanellati, a partner at the International Center for Graphics in Venice, participated in the ICG’s most recent artist’s book, Metropolis. Prints from Metropolis have been featured at Wonder Graphics (see Winter.2015) and full-color catalogs of this international book project are available. September Cabinet Portfolio: Woodcuts and linocuts Patricia Segnan (1940-2010) made at the International Center for Graphics in Venice) reflecting life in the Veneto. P. Segnan returned to painting and printmaking following a successful career in the film industry. literal, abstract and metaphorical in various media, all on paper. Second Drawer: Small Object Studies and Still Life in paint and various print media on paper including prints and rubbings made sing relief objects as the matrix. Blankstein, Cusick, Huff, Maiorana, Mark, Penay, P Segnan, R Segnan, Stout, Strike, Unger, Vess, Zahn. A wall of two of a kind: either in one work or two works that ‘go together like a horse and carriage’, including print variants and diptychs by DMV artists. EXPLORATIONS: Beckie Mirsch Laughlin values spontaneity and paints directly on the canvas without a particular outcome in mind. Guided by intuition, 30 years of painting and teaching art, she travels the universe of her experience in the process of making a painting. Laughlin considers any unexpected imagery that may arise, such as the suggestion of a doorway in Portal, as merely supportive of deeper emotions that arise from the exuberance and dynamics of color. (CC Vess, N Strike, B Jacobs, S Lawrence, T Kenyon, P Firestone, P Segnan, et al.) 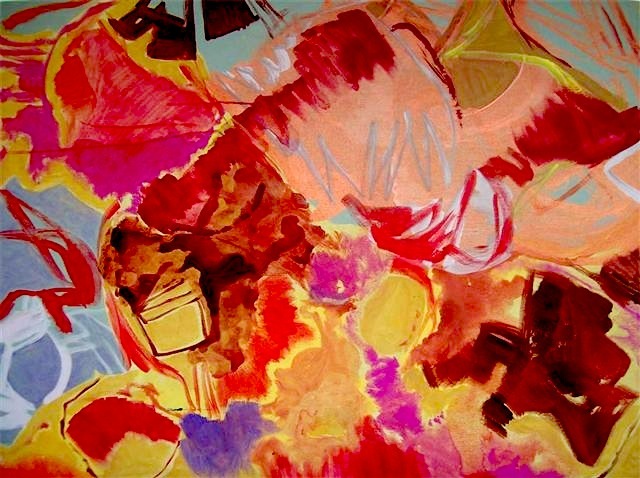 in which color explodes, on paper and other substrates in experimental, abstract and realistic modes of representation, speaking to the sensuousness of heat, grit, and summer breezes. 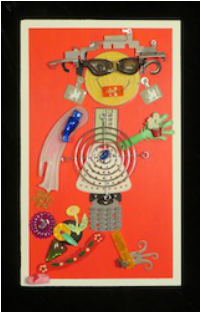 In assemblage works colorful and/or exploded arrays of objects provide the textural base for invention and the imagination. Summer Portfolio: DMV AFTER SCHOOL COLOR. Work on paper that goes beyond poured and layered color. Continuing: Copies of Jim Landry’s Memory Music, the best from Landry’s 8-year blog of paired photos and stories/street conversations, MusicFromTheFilm.blogspot.com, are available (see May). Full-color catalogs of the international book project, Metropolis, exploring the experience of city living(see Dec). GOLDEN DAYS, baseball memorabilia and linocuts. V Raghavan sculpted ceramic vessels, bead and copper necklaces by Wolford and Elliam, cards, gift certificates and fused glass by R Wiener. Top Drawer: TRAVEL: through time, space, land, sea, air and mind. All media, styles and subject matter. Second Drawer: EXPERIMENTAL DMV AFTER SCHOOL COLOR. More work on paper that goes beyond poured and layered color continuing the investigations in the Summer Portfolio at Wonder Graphics downtown. Cabinet Folio Artists: Blankstein, Cusick, Huff, Maiorana, Mark, Penay, Segnan, Stout, Strike, Unger, Vess, Zahn. Workshop Project Wall: PATRICIA SEGNAN: WALL INSTALLATION June 3- July 15. Premier showing of an untitled wall drawing by Patricia Segnan (1940-2010) as installed in her Union Arts Studio on New York Avenue courtesy of Romeo Segnan. The slightly irregular light-dark linearities are established by cloud-like shapes of highly textured bark stretching across the space. Each shape has a slight curvature, bringing, besides a sense of growth, a naturalistic sense of the outside in. Installation viewing: Saturday 12-4 and by appointment. Landry’s watercolor riffs on paper revealing energetic and bursts of thought that explore color and abstraction on paper are featured in the May Cabinet Portfolio. Copies of his book Memory Music, the best from Landry’s 8-year blog of paired photos and stories/street conversations- MusicFromTheFilm.blogspot.com- are available (as well as from Amazon.) Also Hub Caps from the CC Collection. 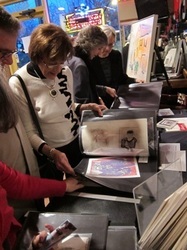 Continuing: GOLDEN DAYS: Baseball memorabilia and linocuts. Full color catalogs of the international artist’s book Metropolis exhibited in WDC, Italy and Germany.. Individual prints each in handmade portfolios available (see Dec issue). Sculpted ceramic vessels by V Raghavan, bead and copper necklaces by Wolford and Elliam, cards, gift certificates and fused glass by R Wiener. 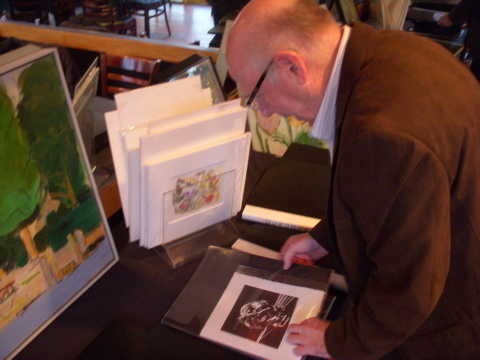 Art consultation, presentations and collection management services by appointment. Second Drawer: SARAH STOUT: (Towers of Observation) series of light sky blue and white collograph prints, framed. 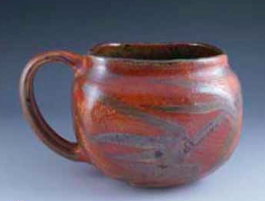 Cabinets Artists: Blankstein, Cusick, George, Huff, Maiorana, Mark, Penay, Segnan, Stout, Strike, A Unger, Vess, Zahn. NEW: The Workshop Project Wall: Changing installations of new work. Various media, subject matter and modes of presentation. Celebrating Black Life features artists including Albert Fennel, Leroy Campbell, Annie Lee and Charles Bibbs who started his own print publishing and distribution company, Bernard Hoyos and James Denmark who portray activities of community life. For example Passion of the Hexing Rites by Hoyos a group of women form a spectrum of color across the page. With waving arms above their heads, the curvilinear lines created by the press of their abstracted bodies animate their absorption in dance. The scene in Denmark’s The Princesses is a leisurely stroll. Two of princesses chat while the third turns to the side to pick a flower.= The shapes of arms heads and feet in black are set off by light color patterned print dresses and overhead parasols in a blue sky, showing the artist’s skill in collage. Prints housed in individual handmade portfolios give a taste of the quality and diversity of the 303 interpretations of Metropolis in the international artists’ book realized at the Centro Internazionale della Grafica in Venice, Italy. The ingenious portfolio provides a book like case that can be put away on a bookshelf and a triptych display stand for viewing. Catalogs of all the book images, printed in Italy also in a handmade portfolio case, are available. See December listing. The Cabinet ART Portfolio winter selection of prints and drawn/painted work on paper includes Blankstein, Huff, Segnan, Strike, Stout, Ungar, Vess and Zahn and others. Also, sculpted ceramic vessels, bead accessories, cards, gift certificates and fused glass. Realist, abstract and non-objective landscapes of nature and the mind. Both sketches and final works with a maximum size of 11x 15”. Second Drawer: Color. 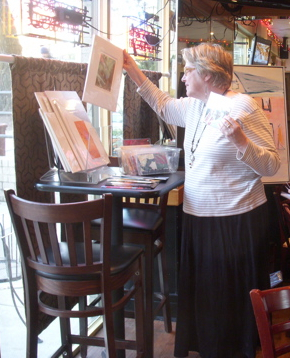 Watercolor, gouache and other media works that rely on color for form and meaning. Artist Portfolios: Blankstein, Cusick, George, Huff, Maiorana, Mark, Penay, Segnan, Stout, Strike, A Unger, N Ungar, Vess, Zahn and Guests. NEW: Projects Space in the Workshop: Changing installations of new projects, work in process and media beyond paper, as well as mini-shows of framed work. Jan 8- Feb 26 Commingled: Genre-Objet Paintings by Claudia Vess. Familiar objects joined with paint on canvas link art and the contemporary environment in unexpected ways. Mimi Wolford’s box assemblages are tinged with irony, sensuality and absurdity. In Life is a Stage, she juxtaposes the personalities, colors and shapes of figurines (of animals and people from all walks of life, including familiar Disney characters) creating stories that often wink at cherished myths. A tiny Tinkerbell in one of the middle compartments of the small letterpress box casts her spell. The proverbial fruit gift box is given a twist in Holiday Surprise, with a prince, Aladan in harem pants, an alien and a Mexican Federale packed in excelsior next to a giant mermaid wearing pearls while crocodiles, fireflies and a bat oversee the sliding lid. The abstract assemblages partake more of compositional issues, patterns, textures, etc. as well as underlying references of former use of the materials. Wolford who is known more widely in DC for her expertise in African Art and her foundation, Mbari Institute, embodies an imaginative freedom, drawing figures with small parts. She captures the swing an arm with a curving fragment of a coat-hanger while the momentum of The Garden Lover Dame stepping out of her garden is powered by a circular wire grate with spokes radiating in four directions. Unfettered by traditional forms, Wolford moves from wall to table to the body as places for art, fashioning elegant wearable jewelry with found emblems, charms and beads from all over the world. An avid environmentalist, she also pays homage to the natural world with a collection of fanciful specimen bugs, made mostly of beads, that are individually preserved in bug jars with air holes punched in the lids. Work on paper in The Cabinet Portfolio features LOST AND FOUND themes, notations and punchlines by Cabinet Artists. A favored late 20th-early 21st c art form reflecting the daily barrage of information and visual imagery including all approaches: clip art, pasted papers and borrowed motifs combined into one artwork. Second Drawer: AUTOMATIC DRAWING. Contemporary artists begin a drawing without preliminary ideas or thumbnail sketches. Some remain nonobjective while some suggest imagery that is then developed by the artist. This technique was originally borrowed from practitioners of psychic arts by the Surrealists to mine the subconscious for subject matter without interference from the rational mind. Third Drawer: COLOR. Watercolor, gouache and other media works that rely on color for form and meaning. Cabinet Artists: Blankstein, Cusick, Huff, Maiorana, Mark, Penay, Segnan, Strike, Turner, Ungar, Unger, Vess, Zahn, and guests. Tango emerged late in 19th c. urban Buenos Aires in response to immigrant working- class struggles for love and economic viability resulting in a complex culture whose emotions Partnoy embeds in images of clasping, dancing couples.. The scenes are full of innuendo with social and political overtones, painted in colors of cafes. In Feeling a woman, contrary to convention, plays an accordion. Drawing on Tango lyrics about young women, Partnoy poignantly exposes the false promises of redemption through café love in the symbolic embraces in Dancing Shoes and Empty Suits. Sketches in pastel are also on view. A painter, published poet and essayist, Partnoy, who moved to the US in 1994, has received grants from the DC Commission of the Arts and the NEH. Her work can also be seen this month at the Argentine Embassy. Translations of poems from her book, Ciudad de Rojos Horizontes (City of Red Horizones) were recently published in the anthology Writing Fire, (Green Fire Press.) Paintings about the experience of survivors of the 13 year Argentine “Dirty War” can be seen at a simultaneous show called, “Packages” at the Argentine Embassy. with Raquel Partnoy, Alicia Partnoy and Ruth Irupe Sanabria, three published poets from the same family reading from their poetry revealing Argentine culture lived under a military regime and the generational repercussions. Alicia Partnoy, Raquel’s daughter and a survivor of the secret detention camps where about 30,000 Argentine citizens 'disappeared', will read from her recently published book of poetry, Flowering Fires/Fuegos Florales. The author of seven books, Alicia is a professor at Loyola Marymount University, Los Angeles. Ruth Irupe Sanabria, Alicia’s daughter and the winner of the Letras Latinas Poetry Prize awarded by the Institute for Latino Studies (University of Notre Dame) will read from her soon to be published second poetry collection, Beast Behave in Foreign Land. The Strange House Testifies, her first book of poetry, won second place in the 2010 International Latino Book Awards. She lives in New Jersey and teaches English in a public school. 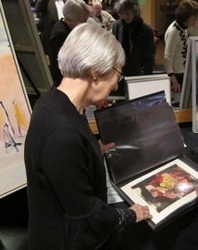 Books are available at the gallery. Featured portfolio: Sarah Stout prints on paper. Stout's collograph prints of Towers are designed for imaginative ascent. Whether mentally climbing on knotted rope or scaling structures one beam at a time, they evoke the experience of traveling and hiking. The collograph technique of gluing layers of matte board to build a relief printing plate results in an image with embossings that create tangible footholds for the imagination. Further assists on the climb are touches of metallic inks that add glints and recede with the changing light, enlivening the spatial illusions. Stout has also fashioned a Tower sculpture of stone and mixed materials bringing the concept even closer to our mind’s eye. Scale, tactility, color and compositional cues guide the viewer to take their own journey for a wider view. Stout's Cabinet Portfolio includes prints with architectural themes. See also Luciano Penay of multi-view schematics prints of former American University Music and Art buildings from 1958. Catalogs of the international artists’ book Metropolis conceived by Andreas Kramer (Berlin) and created by the International Center for Graphic Arts in Venice led by Silvano Gosparini are available. Top Drawer: New and Old prints and drawings including rare portfolios by the Lee Access Print Group and Cabinet Artists with an emphasis on lino and styro block prints. Second Drawer: Automatic Drawings. Contemporary artists begin a drawing without preliminary ideas or thumbnail sketches. Some remain nonobjective while some suggest imagery that is then developed by the artist. 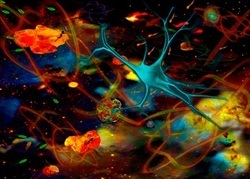 This technique was originally borrowed from practitioners of psychic arts by the Surrealists to mine the subconscious for subject matter without interference from the rational mind. Third Drawer: Miscellany: all media including collage and thread work. Portfolios of artwork by Cabinet Artists: Blankstein, Cusick, George, Huff, Maiorana, Mark, Penay, Segnan, Strike, Turner, Unger, Ungar, Vess, Zahn, and guests. DOWNTOWN: Summer in the City: June- August 29, 2015: Silver gelatin street portraits by Rick Reinhard that established the DC standard for street photography in the 70's and 80's, city scene linocuts by Norman Strike, a photo 2015 photo survey of Kreuzberg in Berlin by CC Vess, prints from French and Dutch travels by LJ Blankstein, and beach pastimes in white line woodcut by Anne Zahn. New blue with yellow glazed, carved ceramic vessels by Veena Raghavan and multicolored glass by Robert Weiner. July 5- August 29: Time and Nature: Gail Hillow Watkins glues and sands down sheets of Sunday funnies and printed papers fusing and exposing residues of imagery formed by mimicking the creative and destructive forces by which nature shapes landscapes, resulting in rich antique-looking textured surfaces that appear newly excavated from some archeological dig bearing mysterious, to be deciphered, messages. The titles and forms take us from precious icons to commentaries on chromosomal dalliances. Catalog for the international artists’ book Metropolis conceived by Andreas Kramer (Berlin) and created by the International Center for Graphic Arts in Venice led by Silvano Gosparini are available. UPTOWN: Top Drawer: Color 2015. Experimental color interactions in various media including natural and man-made textural forms exploring visual ‘push-pull’ and illusory depth created by perspectival devices. Second Drawer: Metropolis and Architecture: Selections of constructiist and imaginary places pertaining to city living considering construction/deconstruction, and interior/exterior approaches to organizing and creating habitable space. Perspectival and close-up details of buildings and the spaces created by contiguous placements. In conjunction with the release of the catalog for the international artists’ book project, Metropolis, available at Wonder Graphics. Third Drawer: Miscellany from the studio: drawings, watercolors, gouaches, collages and thread work. White and Graphite: Respite from the tumult of daily life is available in the work of both artists. The all white relief paintings by Rosenstein rely on ticks of paint that are delicately pulled out of thickly applied paint encrusting surfaces and low relief geometries that deliberately catch light and create shadows. These evanescent marks shift with the light providing a quiet space, in which the viewer can find a moment of tranquility within the tumult of daily life to refresh and reset, retrieving or rejecting thoughts as they contemplate. The sensitive drawings by Mary Freedman provide a different kind of contemplation. This artist renders her careful observations of plants, mostly in pencil, that reflect growth as delicate linear threads that build form. Here the shadows introduce a contrasting sense of mortal time as the viewer steps closer into a more intimate relationship with the process of looking and perceiving. Works with minimal marks and tonalities are featured in the April Cabinet portfolio. 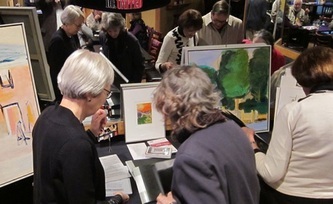 From brief sketches in pencil of small objects and landscapes, to spare etchings, such as intaglio prints by Luciano Penay, linear pastel figure drawings by Nancy Cusick and linocuts of starker contrast by Cabinet Artists. Catalogs of the international artists’ book of 303 fine art prints, Metropolis, conceived by Andreas Kramer (Berlin) and created by the International Center for Graphic Arts in Venice led by Silvano Gosparini, are available, and includes USA artists Berry, Blankstein, Chairvaranon Gohres, Graham, Kunc, Osher, Rowe, Segnan, Vess, Zahn. abstract/constructivist, perspectival vistas and close details. in conjunction with the catalog for METROPOLIS available downtown. Third Drawer: Imaginary and fantastic: inspired by automatic drawing and outsider ideas of kingdoms of the mind, pencil, colored pencil, watercolor and gouache, collage, stitching. Venice, Old Spanish Missions, and other American Architecture. Rudick enhances the rich effects of light and textures of Venice by printing his digital images on canvas (13X19”) giving them an old world sensibility while his images of Old Spanish Missions are printed on Epson watercolor paper to enhance their stucco surfaces. The solidity of the Mission’s wooden beams, and carvings are accented with textured wood frames. Rudick crafts his artwork to evoke what moved him to take a particular picture. He started his photographic journey taking b&w stills on the street and has progressed step-by-step into color and digital technology. The seemingly casual viewpoints in his prints continue to hold viewing interest through careful attention to detail and composition that includes computer magic. His media are a Canon 7D camera, an Epson 3880 printer, and archival ultrachrome inks. The March Cabinet Art portfolio features graphic and digital prints of Venice, other cities and architectural spaces by Cabinet Artists; Lucy Blankstein, Patricia Segnan, Norman Strike, Nancy Unger, and Claudia Vess, as well as a further sampling of Rudick’s prints. Top Drawer: Architecture and Constructivist Style March 2-27, 2015. In all media (photography, digi, pen & ink, and waterbased media,) images pertaining to cities and the process of building including constructivist abstract form expressing both stacking and hung wall approaches to defining spaces. Perspectival, close-up details of actual buildings and the spaces between and created by architecture. Second Drawer: Imaginary and fantastic spaces inspired by automatic drawing and outsider ideas of kingdoms of the mind in pencil, colored pencil, watercolor and gouache as well as collage and sewn linear elements. 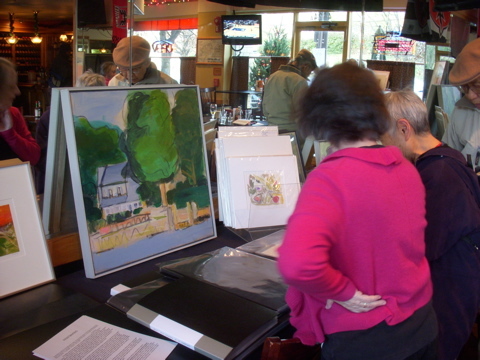 Browse portfolios of artwork by Cabinet Artists: Blankstein, Cusick, George, Huff, Maiorana, Mark, Penay, Segnan, Strike, Turner A Unger, N Ungar, Vess and Guests. 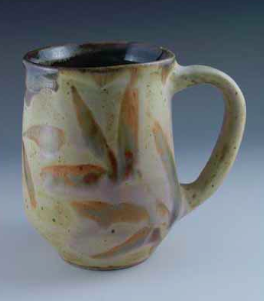 Special winter changing collections of art and craftwork by DCMDVA artists. All traditional, mixed and new media, hand-crafted ceramics, glass and works on paper, as well as baseball and matchbook memorabilia. Outer Limits, Claudia Vess,12x 12x 7"
January : 5-30: Out of this World… SKIES, comets, constellations, the milky way, black holes and other universes bring the outer limits into your living room. Digital recreations, 3-D modeling, photography, phantasmagoria and illusion. Top Drawer: The Sky is the Limit: Sketches and experimental works on paper of Federal cityscapes including mouments and park views with an emphasis on the unique vistas created by architectural height limits. Second Drawer: January : 5-30: An folio of Out of this World comets, constellations, the milky way, black holes, other universes, experimental works. February 2- 27: Weather Rules: A wintery mix of experiments on paper. Colorful white-line woodcuts by Ann Zahn of summer beach dwellers, under umbrellas an, walking, and swaying in the waves, celebrate the sun filled days of summer. Zahn takes woodblocks and etching plates in her beach bag as well as her sketchbook and summer reading - bringing the work home to print in her studio in Bethesda. In her white-line woodcuts, shapes, outlined with cut lines, are “inked” with watercolor and printed one at a time on an overlaid art print paper. The printed color often shows the grain of the wood block adding a sparkling effect of glancing sun. Scenes in black and white by Zahn, plus Sidney Lawrence’s city conflation “Paris, DC" and works by Cabinet Artists are included. A variety of prints by Lucy Blankstein of a mother holding her child by the seaside rounds out this homage to summer surf and turf. In opposition to Zahn’s populated beaches, small monotypes by CC Vess depict the delicate atmosphere of sand and sky bridged by a shell/umbrella or two hinting of summer visitors. Lobsters, crabs, the bounty of fruits and summer pursuits linger into the autumn. Baseball prints by Norman Strike portray the leisurely days of summer. uptown Top Drawer: Drawings and water-based images made with various substances as a major part of the composition, including faux and actual textures added to the paint scuffed or pressed into the paper surfaces. Second Drawer: Wild life: Cows, goats, fish and fowl as well as leisure themes in all media. Browse portfolios of artwork by Cabinet Artists: Blankstein, Cusick, George, Huff, Maiorana, Mark, Penay, Segnan, Strike, Turner, A. Unger, N. Unger, Vess, Zahn and guests. N. Strike, METROPOLIS, linocut/rice paper/ hand coloring, 7x 7"
Top Drawer: Anything goes……..all subject matter (conceptual and process based work) in water-based media (watercolor, gouache, water-based printing ink, acrylics and water-soluble pencils and dyes) including artist studies and finished works. Second Drawer: #2 Lead and Graphite: Notations, sketches and finished works drawn in pencil (and eraser) focusing on travel and outdoor inspiration and execution. Sketchbooks and single sheets. Portfolios: Banks, Blankstein, Cusick, George, Huff, Maiorana, Mark, Penay, Segnan, Strike, Turner, N. Ungar, A. Unger and Guests. Carved bowls, platters, and mugs in celadon, copper and blue glazes by Veena Raghavan; prints by Cabinet Artists Lucy Blankstein, Claudia Vess, Nancy Unger, Andy Unger and Ann Zahn; glass Colorbar platters and Luna bowls by Robert Weiner, felt textile paintings by Roz Houseknecht and shadow box narratives with found objects by J.Ford Huffman. Each spring the appearance of the yellow of daffodils precipitates an etching or monotype series by Claudia Vess. In the drypoint Osterglocken (Easter bells)/ June 4 delicate flowers are hand-held aloft showing the fragility and tenuousness of their emergence expressed through the varied penumbraic printing. A sign of renewal, the bouquet is offered also in homage to the citizens in Tienanmen Square June 4, 1989. Other prints from this spring tradition take an abstract approach to the re-emergence of seasonal color. Top Drawer: Images made with any mark making process or combination of processes, including scorching, puncturing, delicately drawing, sewing, imprinting and painting on paper of all kinds. 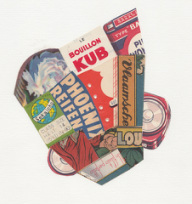 Also, paper collage and conceptual work including sketches for installations and imaginary works. Second Drawer: Tiny art: How small can art go? From 1” to 8 1/2 x 11.
based on one image of a Brown Marmorated Stink Bug, was inspired by the ornamentation of the bug’s shell. Using photography, digital editing, drawing, collage, rubbing and other techniques in different combinations, Unger takes great liberties transforming the bug's natural camouflage while remaining true to the bug’s basic structure. REINVENTION, acrylic on canvas 30x 40"
Painting in a free style Lois Mark captures a contemporary mix of cultures and styles. Her bold approach to abstraction with all its improbable combinations and surprises, is based on years of design for the fashion and textile industry in NY and DC. 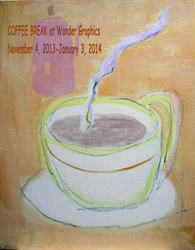 Take a Coffee Break any time with art. Lose yourself for a few minutes in a luscious landscape, or be carried away by the notes rising up from the piano man past the cup of Americano topping the piano in JUKE JOINT JAVA, by Norman Strike. This show features Strike’s linoprints whose compositions are direct and and have a point of view on the local scene. Ink drawings, watercolors, prints and small paintings by Cabinet Artists are also included for a smorgesboard of media and styles. All the works provide a respite from spreadsheets. In keeping with the theme, artist-made mugs and small pitchers by Veena Raghaven and vintage tea cups with saucers are available as well as other hand-made objets suitable for small spaces and gifting. Ann Wertheimer working on a collage in the show in her studio in France. The individual sensibilities of Ann Wertheimer and Anne Banks propel these arrangements of paper, catching jazzy to contemplative pulses. Shapes, colors and textures of paper and a less is more aesthetic are the starting point. Wertheimer’s new collages are composed with found papers including fragments of peeling Berlin posters, and flea markets finds such as sheet music. Bold letters from ad pitches and overlapping and abutting edges of color fields signal vibrant urban environments. Banks, one of the Gallery 10 Gang, traded sculpture and painting for distilled compositions of delicate rice papers. Linear slivers of color and implied shadows, create ephemeral ambient space. The two approaches to collage reflect the depth of the medium. About 20 years ago Charlie Maiorana immersed himself in creating computer art when he designed and implemented an "art generation program." This program initially generated Vasarely-type designs, but as the program grew in features, the generated designs became quite sophisticated. After a stretch of creating sculptures and mixed-media constructions, he has recently returned to creating digital-based art. His current resin-coated pieces start with a photo of an original collage that he digitally manipulates until they have the colorful "punch" and interest that has come to define his style. The ghost of an American Chestnut tree killed by blight dances against a a shimmering moire sky in Laura Huff's silkscreen Rising Moon. The colorful sky heightens the terrible loss of this once towering tree whose unusual nuts are the only ones that contain vitamin C. Inspired by the beauty of the tree and The American Chestnut Foundation efforts to save the species threatened with extinction, Huff combines some of her own old chestnuts - favotite forms and colors- with historical and new images to underscore the immensity of the loss. Hopefully the American Chestnut Foundation grafting project will be as successful as Huff’s method of mixing and combining imagery into powerful prints. Digital Paintings that swirl common templates of microbiotic and macrobiotic forms into complex images including two 3x4' images that glow with celestial mystery in light box frames. Plus imaginary landscapes based on fieldwork in Wyoming. “Emma’s Violin” story by Charles Blankstein, illustrations by Lucy J Blankstein. Emma and Valentine, a golden retriever, discover a violin abandoned by Emma's Aunt when she went to college. Available in hard and soft cover. with portfolios Cusick, Huff, Katzen, Vess, Valk and guests.